**Side note: Tracers is a currently ongoing series that follows after The Glass Sisters duology. While the books can be read as stand alone stories, there are mentions of previous characters from the preceding duology. Specifically, the main hero in this first Tracers book featured prominently in both Glass Sisters books, and the main heroine also played a significant role in Whispers of Warning. I had an unfortunate revelation while I was reading this book: My ultimate take-away was very much focused on how much the characters liked to gaze... at just about anything. Alex gazed with apprehension at the modest wooden cabin. She gazed out at the water. His gaze shifted to Troy. His gaze scanned the bar. And maybe it's not really as bad as it sounds, but there were at least 40 instances of this word being used within the first 100 pages. At most, someone was gazing at something or someone else, or someone's gaze was being described at least once every two pages. The most instances of the word 'gaze' being used in one page was 3 times, I think. And maybe I wouldn't have noticed if it wasn't because I half listened to the audio book version and half read the Kindle version. A lot of reused phrases tend to stick out more when you listen to an audio book, it seems. One of the things that I remember liking about the first four books I'd read by Laura Griffin had been her writing style. Because while I wasn't too fond of her characters or even some of her plot progression, her writing style was decent and actually kind of creative. An okay plot and not so okay characters can sometimes make it past my radar with decent writing. Of course, I must have blocked out the part where this author likes to reuse certain phrases several times within a few pages. One of the phrases that stood out to me before in the first two duologies preceding the Tracers series had been "she fisted her hands on her hips", which I remember seeing used twice within the first chapter of one book, then again in the very first chapter of the second book following. Creative writing style, maybe. A decent use of vocabulary... maybe not so much. And still, I managed to enjoy Untraceable after getting past the fact that I need to quit listening for the next instance in which Ms. Griffin inserts the word 'gaze' or a variation on that word. Alex Lovell is a private investigator with a skill for computers; she does what she does really well, and one of the things she does is help make people disappear. She's kind of like a private "Witness Protection" type of firm and we first met her in Whisper of Warning when the protagonist of that book, Courtney Glass had been in a heap of trouble and needed to leave town. Alex had helped her create misleading traces with fake credit cards and phone activity in different cities, and then got her to disappear from the grid altogether with instructions for a low profile life-style. Melanie Coghan is another such client Alex has helped out in this fashion, except that something has happened to prompt Alex's concern that Melanie may have truly disappeared for real. Suspecting foul play and something much more gruesome, Alex pleads the help of Austin PD Detective Nathan Deveraux. The two had met during the events of Whisper of Warning and had immediately developed a spark of attraction. And so amidst a mystery-not-quite-mystery and crime thriller going on in the background, the Romance between Alex and Nathan continues to run its course when the two meet up again in Untraceable. To be honest, I'm not sure there has been a romance so far in the Romantic Suspense novels I've read from Laura Griffin that I liked. They've been pretty mediocre at times (The Borderline series). At worst, I got frustrated and angry (Thread of Fear). At best, I enjoyed, but still thought it wasn't really anything to write home about (Whisper of Warning). 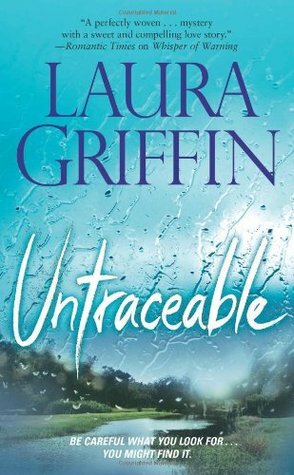 So I'm not sure what it is that keeps bringing me back to Laura Griffin's books, except for the fact that it had been the Tracers series that had gotten my attention in the first place. The other books I read because I like reading things in publication order if I can do so. And also, the concept of this book intrigued me. I have an interest in cyber crimes, and private investigator stories tend to be a topic that automatically gets my attention. I have even more interest in forensics and so the entire premise of the Tracers was just right up my alley. Untraceable had a pretty good premise and a decent story progression. The characters really aren't that bad either, but it's not like I really loved them or liked them or anything. I like that Alex is independent and able and smart and resourceful. I don't like that she had a ton of TSTL moments. I like that Nathan is a good cop and a good person; I don't like that he has his moments of broody alpha male that borders on man-handling and being unreasonably "I don't want my woman doing this and that"-ish. And so, once again, the romance didn't exactly elicit any cheers from me. The crime thriller behind Untraceable actually had a pretty good, strong start. Things were rolling through pretty well with Meghan's disappearance, the reveal of her abusive husband--who may or may not have killed her--being LEO, and then more twists about a bigger conspiratorial scandal to do with drugs, prostitution, and the like. And then a lot of other things happened to drag time out a little bit and I started getting a bit lost. That's not to say I wasn't entertained. Laura Griffin DOES have good writing style--if you look past her tendency to use similar or the same phrases over and again, one too many times within very few pages. Final Thoughts: Enjoyable to an extent. That's really all there is to it.